Canadian lynx usually travel and hunt on their own. They are generally more active at night than day and will do whatever they can to avoid humans. 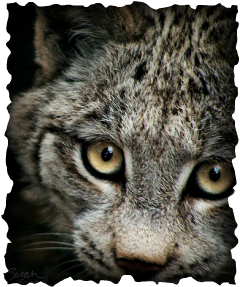 Canadian lynx are very skilled hunters and their phenomenal hearing and eyesight are a great help. Canadian lynx are not normally very picky about their diet. They will eat mice, voles, grouse, ptarmigan, squirrels, and even birds when they can get to them. One specific prey that Canadian lynx prefer is the snowshoe hare. The lynx and the hare actually go through a ten year cycle together. 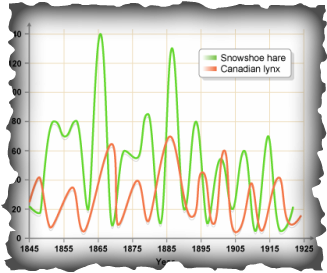 The snowshoe hare population takes a huge plunge down in its population. After that, they come back to their normal amount so that the cycle can repeat. 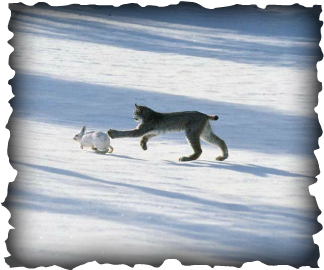 This photo shows a Canadian lynx pouncing on a snowshoe hare. This graph shows the stats of the ten year cycle the lynx and the hare go through. The Canadian lynx breeds between March and May. They will normally have a litter of about 1 to 8 cubs. Cubs don't leave the den alone until 5 weeks into their lives. They will not hunt for themselves until they are around 7 and 9 months old. Canadian lynx cubs are blind for up to seven days once born. Their eyes are blue when born and change to a brown-hazel color as they mature. 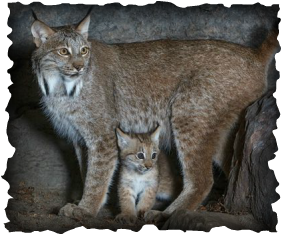 The word lynx means "Light, brightness." They are named this because of the luminescence of their reflective eyes.